Adding Colour Washes to a Monoprint. I've added some light washes to the monoprint of Michael Portillo that I did the other day, and darkened the background with black gesso. The colours I used were yellow ochre, alizarin crimson and delft blue, and the ink which was water soluble dissolved slightly to help blur the edges. Here's the original. A good experiment - I shall try more tomorrow. 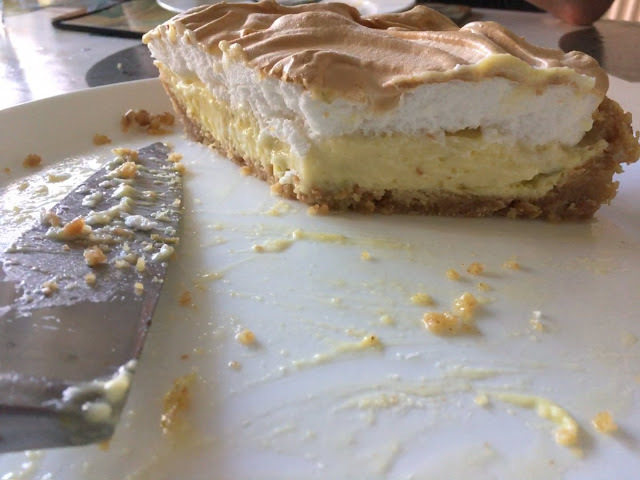 This weekend I made the Hairy Bikers version of Key Lime Pie. 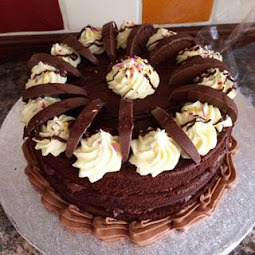 There were mixed reactions so I don't think it will make it onto the website but the lime filling was really lovely - tangy - so am delighted to share in case you'd like to try. Base: Melt butter in a saucepan then pour over the biscuit crumbs. Add the sugar and mix to combine. Spread into a 9inch pie case making sure to cover the sides well. Filling: Whisk the egg yolks until pale and fluffy. In another bowl, whisk lime zest, juice and condensed milk until smooth and creamy. Mix into the egg yolks, and pour into pie case. In a clean bowl, whisk egg whites until soft peaks form, and fold in the sugar, vanilla, and cream of tartar, then whisk again until stiff peaks form. Spoon the mix over the filling using a fork. Bake in the oven for 15-20 mins or until golden brown. Remove from the oven and allow to cool. Place into the fridge to chill before serving. Ours was kept in the fridge for a couple of days, and it was fine. This has been a family favourite for years. 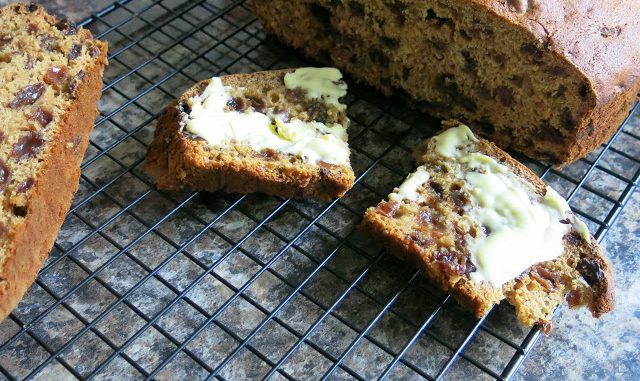 It's a lovely no fat, moist, fruit cake/tea bread which is incredibly easy to make. It improves with keeping but it's hard to keep your hands off! Put tea, sugar and dried fruit in a bowl, and cover and leave to soak overnight. Mix the soaked fruit and sugar plus the liquid into the flour. Add the beaten egg to make a smooth mixture. Turn into a greased 8" tin and bake at 350F, Gas 4, or 150 Fan for about 1 hour 30 mins. The recipe actually says 1 hour and 45 minutes, but it's always done sooner especially in a fan oven. Softening some edges with a little water. I'm not sure how this will end up but that's the point of my sketchbook - to find out! Part two will follow shortly - I'll be adding colour to today's portrait. Monoprinting is a great way to get a likeness. I'm working in a sketchbook and I'm covering a couple of pages with a layer of gesso. You don't have to do this when you monoprint of course, but it's an extra that I've added as I want to come back in after printing with some colour, and the sketchbook pages need priming. You can monoprint quite successfully onto gesso, even if it's quite rough. These are the materials I'm using. 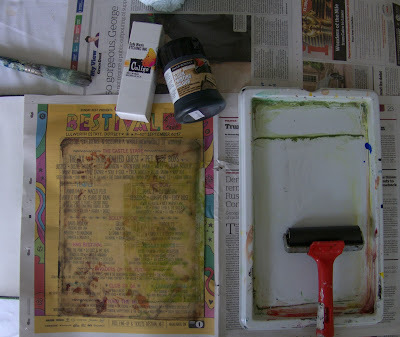 There's a couple of inks in the picture and I've decided to use the black block printing ink which is water soluble. The Caligo ink is oil based but also water soluble. The difference is when the Caligo is dry (about 2 weeks) you can paint over with wet media. 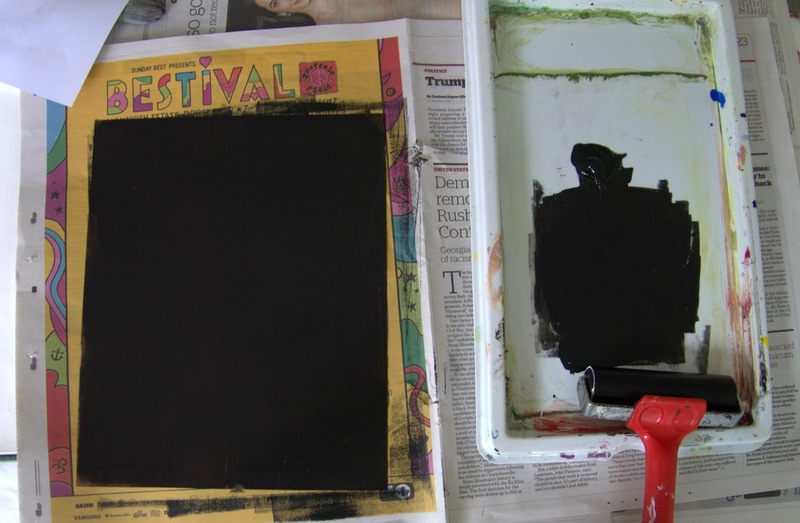 A brayer and printing tray and an A4 acetate sheet. This comes off of a gelli plate (it's the protective cover) You could also use plastic sheeting, laminating sheeting, plastic folder covers, laminated A4 paper, etc. I've squeezed a little ink onto the tray, and am using the brayer to apply a very think coat of ink to the plastic sheet. 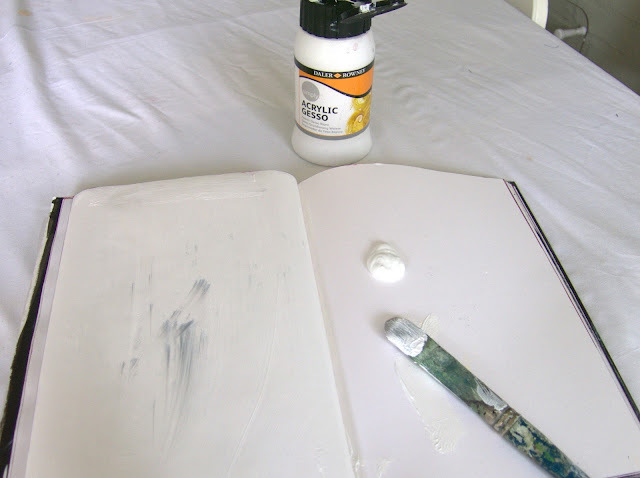 Place your inked plastic sheet onto your dry gesso sketchbook page. Ink side down. Put a photocopy of the person you wish to monoprint over the top of the sheet. Very gently, using a biro, go over the outlines and shadows of the photocopy. Be careful not to lean to heavily on the photocopy or you will transfer your palm prints to your picture! You can see the biro marks I've made onto my photocopy. When the ink is dry, I shall paint. Turning out my stash of fabrics recently, I found several old ones which I know I'll never use but was loathed to throw away. I decided to overprint and transform them and maybe give them a new life. First of all choose your fabrics with care - you need to be able to see your printing after all! I chose a beigy/brown patterned cotton. Make yourself a temporary print table. You need to have a surface with a bit of give in it to get a good print. I used a double layer of polyester wadding over a drop cloth (which is always on my table to protect it) You don't need a drop cloth if you're not messy. Put your ironed fabric over the top of the wadding. These are the 3 print blocks I'm using. I get mine direct from India, but any block you like will do. 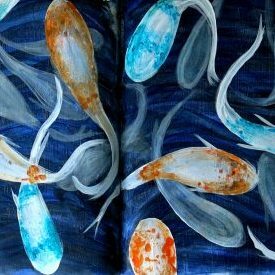 If you don't have a block, you could try using a lino cut, a carved rubber, or even an old pizza tray which you've impressed with a pattern (use a biro - it cuts to a suitable depth and is fine enough for an intricate pattern). I'm using acrylic paint - any kind - squirted onto a tray. You could use an old plate, palette paper etc. You will need a sponge. This is to dab the paint onto the block. It gives a more reliable print than using a brayer. My bit of sponge is a children's paint applicator without it's handle! If you buy a large sponge from a chemists, you could cut it into chunks and use each chunk for a different colour to save washing in between applications. Dab the sponge into the paint a couple of times to get a covering on the sponge - you don't want huge dollops but an even covering. Then dab the sponge onto the block so it is entirely covered with paint. You need to be firm but gentle and not rub. Place your block on the cloth and press. One good firm press should be enough and try not to move the block whilst your pressing. 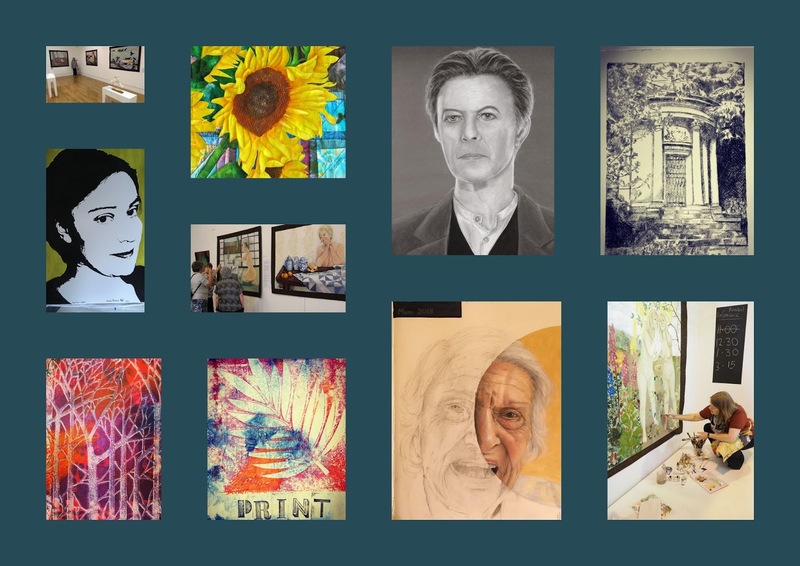 And you have a print! This one isn't that square to the fabric edge so it's something to consider if you're planning on a large cloth. Here's the print en masse. Here's another small block and an edging block to use up the paint.